Moneymaking opportunities like this one don’t come around often. In 2016, America’s coal industry faced devastation. The four largest coal producers had gone bankrupt. The biggest coal ETF (KOL) had plunged 90%. Regulations enacted by the Obama administration were choking the industry. The market HATED coal, which is the dirtiest of all fossil fuels. Investors dumped coal stocks as if coal would be phased out as an energy source in the near future. But anyone familiar with the data knew this was an emotionally-driven fantasy. You see, three in 10 American homes and four in 10 global homes are powered by coal. Cleaner energy like solar and wind will surely eat into this over time. But smart investors knew it would take decades to re-work global power grids to replace coal. Until then, global power plants will continue burning coal by the railcar load. This reality dawned on the market in early 2016. 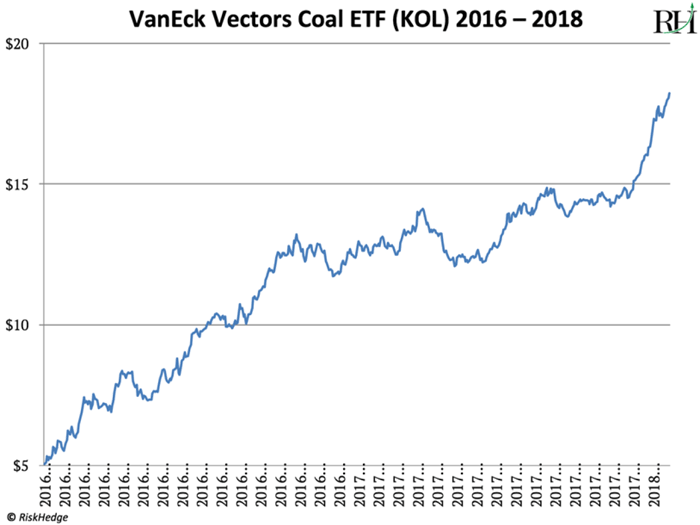 Coal stocks bottomed and the KOL ETF leapt 242% over the next two years. It’s in uranium, which you probably know is what fuels nuclear power plants. Like coal, uranium is an “emotionally charged” resource. Bring it up in conversation and many folks will get all worked up about Chernobyl or Fukushima. Never mind that nuclear is the safest energy source, according to the World Health Organization. Right now, investing in uranium is one of the best opportunities I’ve seen in my career. We have a realistic shot to make 3-5x our money or more in a few years on the uranium company I’m going to tell you about. I don’t make this prediction lightly. Between 2003–2007, the price of uranium shot up from $10/lb to $136/lb. 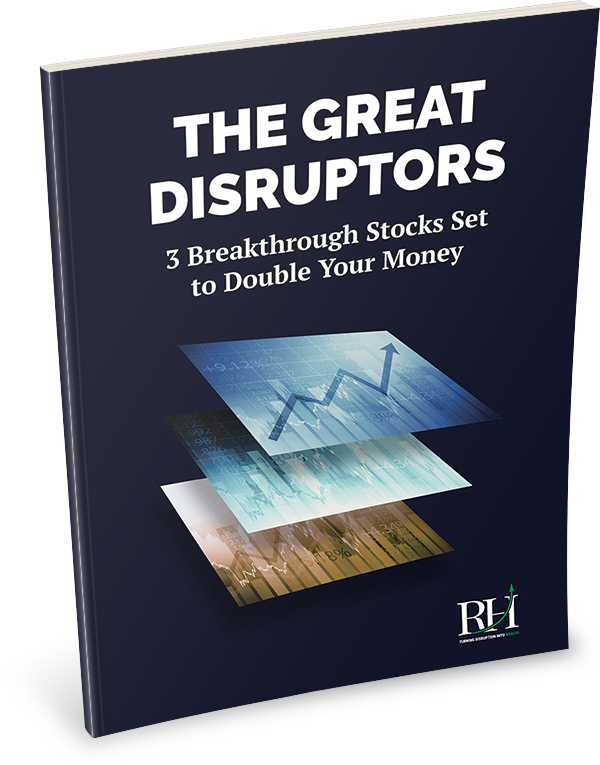 Many uranium stocks climbed over 2,000%. This has gutted the uranium industry like a fish. Today it costs between $50–$60 for most companies to mine a pound of uranium. But uranium sells for around $25/lb, and it’s been below $50 for over six years. This has put all but the lowest-cost producers out of business. Ten years ago there were more than 500 uranium companies. Today there are about 40. And many of the survivors are barely hanging on, having lost 90% of their value since 2011. It’s a complete bloodbath. Just like coal in 2016. But nuclear energy powers one in every five American homes. It provides 56% of America’s “clean” power. And according to the World Nuclear Association, demand for uranium around the world is steadily growing. Since 1980, annual demand has climbed 119%. And with 57 new nuclear reactors currently being built, demand is expected to grow by another 23% by 2025. In other words, not only is nuclear power not going away. It’s growing. Nuclear use is growing… yet the uranium ETF URA has cratered 90% since 2011. Nuclear use is growing… yet no company on earth can turn a profit selling uranium at today’s spot market price. This simply cannot continue. Either 20% of American households will have to shut their lights off, or the price of uranium must rise A LOT. Like coal in 2016, the market is pricing uranium investments as if nuclear power is going away. I expect this to resolve in a big bull market for uranium. Saudi Arabia produces 13% of the world’s oil. Needless to say, this news would be extremely bullish for the price of oil. Well, the equivalent just happened in the uranium market. The world’s largest uranium producer, Cameco (CCJ), just announced it will keep its flagship McArthur River/Key Lake mine closed down indefinitely. This isn’t some rinky-dink operation. When it’s up and running, McArthur River/Key Lake supplies around 13% of the world’s uranium. It’s the world’s largest high-grade uranium mine. The quality of the uranium there is 100x better than the global average. Since the announcement, uranium prices have jumped 12%. I believe Cameco management made a wise decision in shutting down McArthur River. Why deplete the world’s highest-grade uranium mine for a loss? By halting production, CCJ is not only stemming its losses. It’s removing 1/8th of the world’s uranium production from the market, which should push up the uranium price. And CCJ isn’t the only company cutting uranium production. According to leading uranium analysis firm TradeTech, major producers will reduce their output by around 15,000 tons this year. That’s a giant 25% reduction based on last year’s production. To put it into perspective, it would be like Russia and Saudi Arabia shutting down oil production. 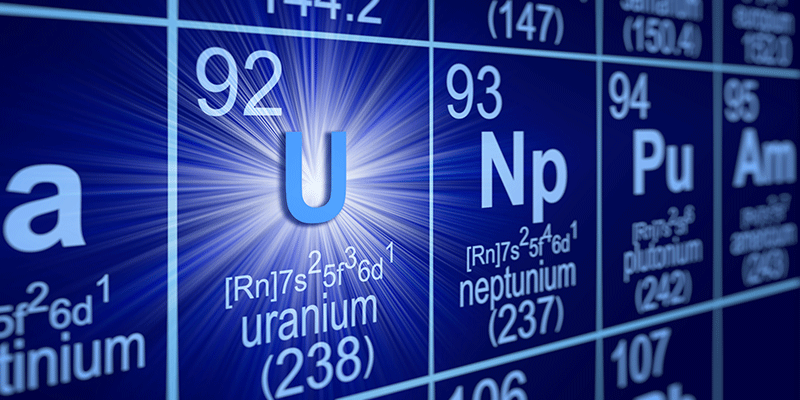 According to the Ux Consulting Company, uranium demand will be 87,000 tons this year. With only around 44,000 tons of new production coming into the market this year, this will create a huge deficit. And eat into utility companies’ stockpiles. And here’s another important detail. Cameco plans to become an active buyer of uranium. On its quarterly call last week, CEO Tim Gitzel said the company plans to buy around 10 million pounds in the market this year. And 20 million next year. That’s significant as the amount of available uranium to buy on the spot market each year is only about 25–30 million pounds. I think the uranium price bottomed in November when it hit a 13-year low of $18. It has edged up 43% since then. Meanwhile, Cameco’s stock is up 38% in less than two years. Cameco has huge leverage to the uranium price. According to the company, for every $5 rise in the uranium price, its revenue jumps $37 million. Cameco is the gold standard of the uranium industry. It produced 16% of the world’s uranium last year, and is one of the world’s lowest-cost uranium producers. As I mentioned, most companies produce uranium for $50–$60 per pound. CCJ does it for around $35 per pound. Its two largest mines are McArthur River/Key Lake and Cigar Lake. Both are located in Canada’s Athabasca Basin, home to the highest-quality uranium in the world. Despite a seven-year depression in uranium, Cameco has a healthy balance sheet. As you’d expect, CCJ’s revenue and profits have fallen along with the uranium price. But the company has plenty of cash to fund operations until the true bull market in uranium begins. It has $470 million in the bank, a 190% increase since last year. And it hasn’t taken on debt to survive the uranium downturn. In fact, it has paid down debt since 2013. To sum up, Cameco has weathered the bloodbath in uranium exceptionally well. It is set up perfectly to cash in as the price of uranium rises. Keep in mind, CCJ shot up over 2,000% in the last uranium bull market. I’m looking for Cameco to leap 3x–5x in the next few years. I’ll be in touch next Thursday. As always, feel free to write me at stephen@riskhedge.com.